Wealthy Italian families, lost love, definite class separation, and family secrets are what you will find in the THE HOUSE OF SERENADES. Many of the characters had secrets, but Giuseppe Berelli had the biggest secret of them all. Giuseppe kept a secret his entire life, and he was now becoming afraid the truth would come out and ruin his life. Giuseppe told stories to cover up his secret and to try to keep his family from losing their class distinction and power. The author is hosting a giveaway of her book. Scroll below this review for the link to the Giveaway and the Giveaway Guidelines. Roping cattle, trading horses, living in log cabins, cooking on a wood-cook stove, an all-purpose store in town...... you will experience all of this as you turn the pages. A STORY OF THE WEST follows Matt Daly, the owner of the D Rockin' D cattle ranch, through cattle drives and through his daily life and gives a wonderful explanation of a cowboy's life at home and his travel from one open field to another rounding up cattle. I enjoyed the account of how the towns sprung up and how folks knew exactly where to put saloons and all-purpose stores to help the West become populated. The description of the stores, the ranches, and the daily life was very vivid and made you feel as though you were experiencing all of it along with the characters. Life in the 1880's included the difficulties of cooking, bathing, and staying warm in the winter. This life was a lot of hard work and also a difficult life for the citizens as the West was being developed, but all of this was a part of a settler’s daily living. You will also be a part of Lavina and Matt’s love story as well as the life of the rough cowboys and gunfights in the lawless towns. You will vicariously live through all of this and enjoy the story through the great depiction by the author. Ms. Spence did a wonderful job recreating the development of the West and portraying what family life was like during the 1800's. The story had suspense, colorful characters, and interesting facts that kept you reading. Matt Daly’s story, along with all the people he met, was merged in a very engaging way throughout the entire book. I thoroughly enjoyed A STORY OF THE WEST. We should all be interested in how our country was developed and be thankful for these pioneers that lead the way and for their taking the brunt of all the work and determination to create towns that were the beginning of what we have today. 1. You must be a citizen of the United States. 2. You must be a NEW or OLD Follower of my blog...please click the JOIN THIS SITE button to become a new Follower. A former Coast Guard helicopter pilot turned housewife, a murder, an explosion, and two groups named ALF and ELF greet the reader of A HAPPY HOUSEWIFE by Kate Cooch. Sam Sherman was now a stay-at-home mom who was great at helping others. Sam became involved with Helen since she needed help after she had hip surgery. The involvement with Helen seemed innocent, but it turns out that Helen had some friends that were quite deadly. The book centers around Sam and Helen with Sam silently being taken advantage of by Helen. A lot of information concerning two terrorist groups, which I have never heard of, was revealed. Sam, the happy housewife, turned out to be a great detective and helped solve the mystery of an explosion that had killed one teenager and caused burns on another and that also helped capture active members of the ALF and ELF groups. The book was ok and not very long....the last 20 pages were the best. The writing was good, and the author did get you involved in the story. The author created a great ending, but I am going to give it a 3/5 simply because it took a while to get me interested. Life in King Henry's Court definitely had advantages for men, but not women, but the life in the 1500's was quite interesting. There were ladies in the Queen's Court that waited and served her and gentlemen who went to war. No one could disobey the King and his edicts. One false move, and it could be off with your head, imprisonment, or a burning at the stake. Life seemed quite harsh with the many do's and dont's in terms of religion and what was required and expected in terms of following what the King declared. It definitely was a difficult life during those times....people had to fear for their lives as well as to be concerned that they didn't do anything against the King. Lady Juliana St. John is the main character. The book focused around her and her activities in the court and in her personal life. It also focused on a secret that kept her from happiness and it also focused on her prophesies that seemed to come true in time. She also discovered another secret toward the end of the book that has been kept for a long time. No matter what was transpiring, Juliana had a part in it and was loved no matter what. Her life revolved around the Queen, and she originally was brought to the castle for the purpose to serve the Queen and to learn the ways of the Court. The women that tended the Queen were friendly but each one was worried they would do or say something wrong. A few of the ladies were always looking to see who was not following what the King had made law and they included the Queen in their watch. Everyone in the court had to be proper yet the undercurrent was less than favorable. Julianna was very loved by the Queen, but I think also used by her. The book is historical and very informative. The author makes you feel as if you are in the book living the lives of the characters and feeling their terror, their pain, and at times their joy, but I definitely am glad I did not live in that era. The formality and the strictness would have driven me crazy. It was intriguing, though, in terms of history, and I liked the author's notes at the end that told how the lives continued after the last year in her book of 1550 was noted. The extensive Family Trees definitely helped spell out who was who. The author did excellent, extensive research. The ending was redeeming and uplifting even as the turmoil of life in the King's Court and in the 1500's continued. Seeing the set of rules the citizens had to live by and following Juliana throughout it all was very educational. Even though I am an avid history buff and loved the storyline, my rating is going to be a 4/5 because it did get tedious at times. I received a free copy of this book from Howard Books for my honest review. The opinions expressed here are my own. A maiden aunt, a new Vicar with a book and secrets, and a curious, precocious young lady. Gothic Spring will grab you from page one....the setting, the time period, the charming, small town, and the storyline are very alluring. The storyline was focused on Victorine and her relationship and fascination with the Vicar and a secret she just knows he has and secrets they both will eventually share. Victorine, the main character, has an air about her that makes her likable for her intelligence and her persistence. You will dislike her for her insistence, her false innocence, her trouble making, her desire to hurt people, her cunning ways, and her way of risking anything to get what she wants....nothing short of deceit. Despite her negative traits, I was thoroughly taken by her as was everyone in the small, gossip-laden town of Braxton, and I wanted to see what she would do next to get what she wanted. She always did get what she wanted while she also ruined lives. Each character in the book is fascinating and very well developed so that you can perfectly visualize their clothing, their feelings, and their facial expressions. The characters were profound, and they all had great depth especially Victorine and the Vicar's wife. She and Victorine definitely were at odds and both prodded and prodded until they found the information they were looking for even though Victorine always came out the victor with her sly nature and way of turning things around for her benefit. Every character seemed to have something hidden and churning under their politeness. This book is very inspirational, has great advice, and humor as well. The way the book is organized and the sub topics for each chapter keep your interest and truly make you think about the comments and advice and how these suggestions take a little effort but are definitely worth trying. The ending of each chapter had mental "workouts" to help you get on track and gave you guidance for trying each idea....a very creative idea. The entire book was uplifting, and made you feel good after completing a chapter. You definitely won't be a pessimist after reading this book. This book is not time consuming and is without a doubt one that makes you realize that changing your life is worth the happiness you will feel in the long run. I definitely enjoyed trying the mental workouts….I need to do more and not miss a day. In my opinion, your brain is pliable no matter how old you are, and this book isn't only for the youngsters. Give it a try....you will be happy you did....and you may be happier than you ever thought you could be. I am working on it. Thanks for the copy of your wonderful book, Brian. London, Paris, New York, Greece...how far will this search reach? Looking for the lost Parthenon Marbles seemed to be reaching from one end of the world to the other. The puzzle was trying to find out how they got stolen, where they were now, and how they would be found along with an explanation of why they were stolen in the first place. As far as the search reached, the characters were miles apart as well. The characters were hilarious, devious, murderous, scheming, innocent, historical, and clever. The history lesson in terms of characters and events made the book fascinating, but it was confusing at first in terms of how the time periods jumped around. The historical events and people included the Titanic, Pandora's Box, the Parthenon Marbles along with Napolean Bonaparte, Jack the Ripper, Churchill, and many others. Despite the confusion with the different time periods, the history in this book outshines the confusion once you get on track. When the action begins with the characters and the search for the marbles, the book becomes more interesting. Mr. Jackson is amazing with detail and with description of landscapes, characters, and events. My rating was steady at a 3 until the book started to get attention-grabbing with character interaction and intrigue. Since the book did get a lot better, I am boosting my rating to a 4. And....the ending is definitely worth the wait. So.....don't give up because of the disconnection of what is going on, you will find a great history lesson, intriguing, secret rooms in homes, interesting, out-of-the-ordinary characters, and a virtual tour of Greece, which to me sounds like a beautiful place. I received this e-book from the author for an honest review. All opinions in this review are my own. I also have to thank Kathy of http://bermudaonion.net/ for helping me with the registration for this event. 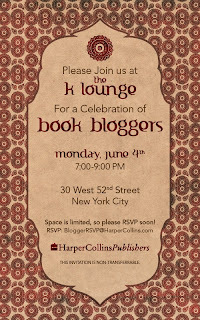 After all the excitement of registering and realizing I am actually going to attend, I received a BY INVITATION only e-mail to an event hosted by Harper Collins Publishers on Monday night, June 4. I was ecstatic when I opened the e-mail this morning. 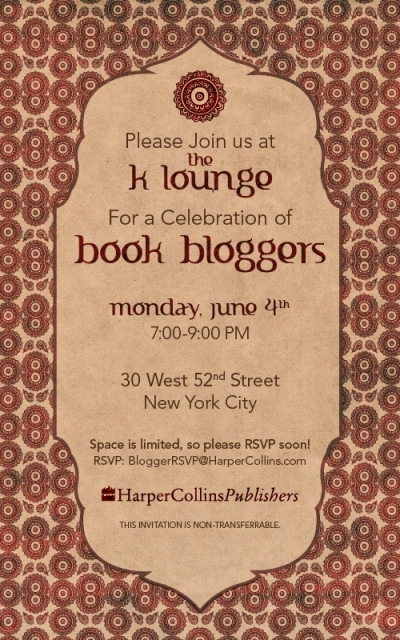 I want to share the invitation e-mail I received so you can see where I will be on Monday, June 4, before all the regular excitement of the BookExpo begins on Tuesday, June 5, and continues through June 7.